You can trust that your order will be quickly processed and safely delivered. We can ship products anywhere in the United States using UPS Ground. Our shipping charges are determined by the total weight of your order. Please understand, most internet shipping calculators give you the instant shipping cost even before the package is put together. They add extra on to the actual shipping costs to protect themselves. We calcualte the shipping after we have boxed up your order and charge you only the actual cost. After your order is boxed and shipped we will send you a confirmation email with the charges and shipping. 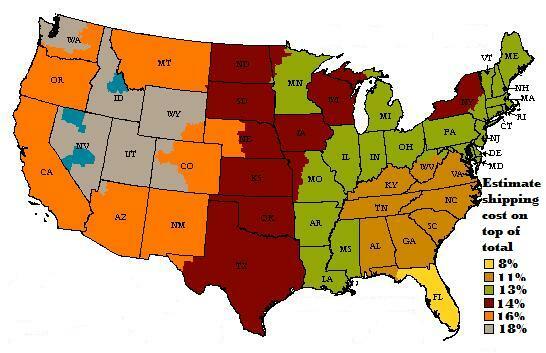 View the map for ESTIMATES on shipping based on the total orders cost. At this time we cannot ship to international destinations online. For international Orders please call to as we do International orders over the phone. PLEASE NOTE SHIPPING TO BUSINESS ADDRESSES WILL SAVE YOU MONEY!